The other day I was watching CrimeWatch on the tele and found myself wondering how long it would be before the police could use the Internet to trace suspects. With the advancements in facial recognition computers are now able to recognise faces from photos and even moving images. This week Googe Street View was brought into action by Derbyshire Police. A man had his caravan stolen from his driveway, and as if by magic, Google’s all seeing eye was passing at the time. The number 1 suspect in the case is the owner of a Range Rover type of vehicle that was seen standing next to his vehicle on the driveway where the caravan was stolen. He did not have permission to be there. As you can see from the photo, the suspect looks very, suspicious. 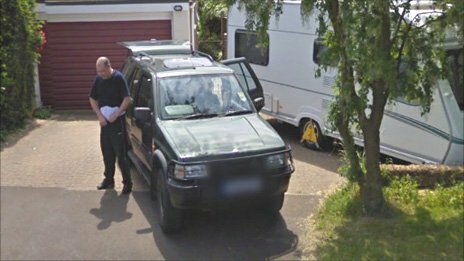 Parked on the driveway next to the caravan, in a large vehicle capable of towing the caravan, with doors and boot open, probably just about to use tools to remove the caravan wheel clamp. So, if you recognise this man, or the vehicle, or if you have seen this caravan on the market recently, call Derbyshire Police today! Sorry, that is what they say on CrimeWatch, couldn’t resist. I wonder how long it will be before councils and private firms all over the country make their CCTV available on the Internet and then use facial recognition software to trace people. With Google caffeine whizzing through the Internet likes a hurricane and the fact that just about every place in the UK is now under CCTV of some description, it may not be long before we are able (or Google and The Police) are able to trace people, or at least their movements, very quickly.